“How’s my hair?” – Lord Sir Roland Somerset Montgomery, Duke of the Three Isles, Lord of Havershant, Slayer of the Bilious Dragon, Protector of the Illythians, Victor of the Siege of Alsburg, Haver of a Great Beard, Defender of the Danes, Conqueror of Guilardia, Prince of the Glorious Summer of ’14, Knight of the Order of the Exalted Lion, Honorary Abbot of Canterbury Cathedral, Champion of the City of Bath, Marshall of the Eastlands, Knight of the Crimson Buckle, Admiral of the Northern Seas, etc. As a young knight, bold Sir Roland vanquished the fabled Jade Knight, and for a brief moment his eyes pierced the veil between worlds. He beheld the Valkyrie Hypernia as she lifted up his defeated foe. Overcome by her beauty, Roland dedicated his life to gaining glory in hopes of seeing the Valkyrie again. 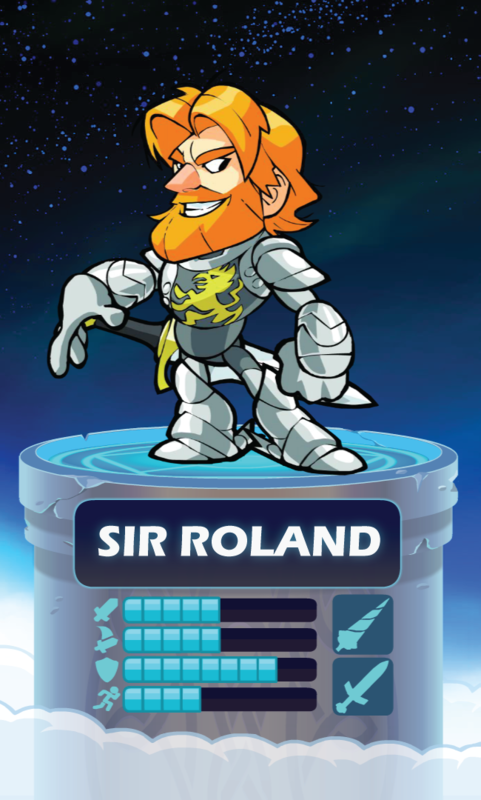 For the next fifty years, the proud, bullheaded and charming Roland won more victories, made more enemies and broke more hearts than any knight of his time. His single-handed storming of the Fortress of Alsburg inspired forty-seven epic ballads and a Lifetime miniseries. Bards wrote songs about the song he wrote commemorating his victory over the Bilious Fire Drake. As an old man on his deathbed, Roland finally beheld Hypernia again. She could not allow a natural death to keep such a warrior from Valhalla, so, with a ghost of a smile, she punched him herself so he could die in battle and she could offer him a seat in the hall of glory. No one in Valhalla feels a greater thirst for victory in the tournament than Sir Roland. He rejoices with every win and rages at every loss.